Shopbop’s Friends and Family sale started this morning! Enjoy 25% off your entire order when you enter code INTHEFAMILY25 at checkout! With the cold, rainy weather we’ve had so far this week, I’m eager to stock up on cozy sweaters and warm shoes for wearing around the house. This sparkly cuff is also calling my name. What are you going to buy? Yesterday I had a serious “pinch me” moment, when I came home to this gift from Gucci. That’s right, Gucci sent something to me of all people. I’ve been obsessing over this bag for months and as luck would have it, Gucci sent it to me in my favorite fall shade. It’s like my hard work on this blog is really starting to pay off and I feel so grateful to work with designers like Gucci that I absolutely love! For those of you lucky enough to get yesterday off of work for Columbus Day, you might have missed my latest outfit post! I shared a look featuring three new fall pieces, two of which are under $100 – this skirt and these heels! Click here to check it out in case you missed it! These sunnies are so cute, love! Glad to know I’m not the only one who had to work yesterday! Love your picks this week, I have been eyeing those pumpkin flats, how fun are they?! Your edit is exactly what’s been on my mind as well. Those pumpkin flats are too much! need those flats in my life! oh em geee i need to be in those boots, with a spiked hot coco! Aww the Eiffel Tower studs are so cute! 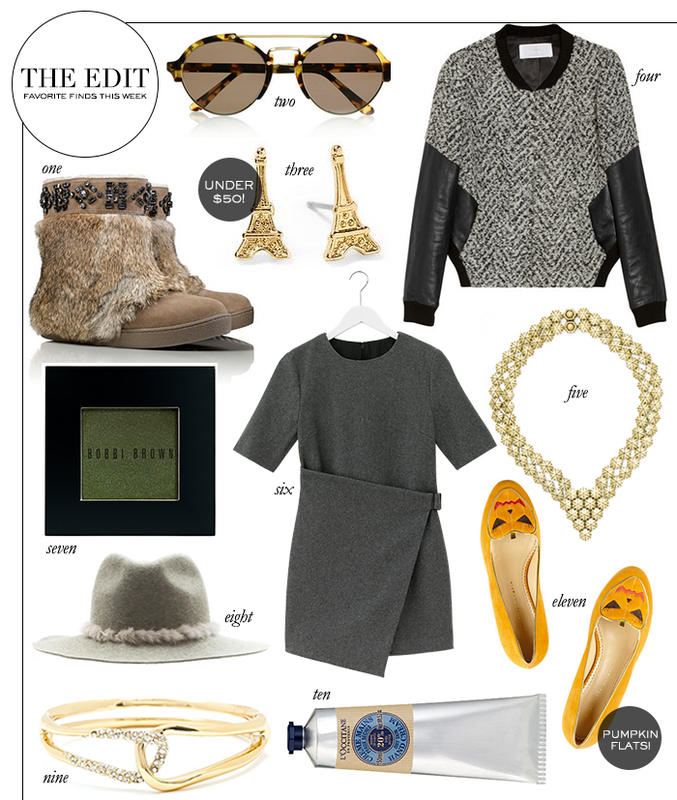 Pretty sure I need those Eiffel Tower earrings — too cute! Those pumpkin flats are adorable! And that leather + knit sweater is gorgeous! Great round up!